Bamboo (Phyllostachys): growing, planting, caring. Bamboo, the most essential element for feeding your growing panda! Bamboo brings together a number of genera: Phyllostachys, Sasa, Arundinaria, and Fargesia, which explains their diverse behavior in the garden. Some can be trimmed, others not so much, and most are even invasive, excluding fargesia, which grows in clumps. They are evergreen and don't require any particular care except for clearing rhizomes if a barrier wasn't installed beforehand, and regularly trimming old stems. Bamboos are orginally from Asia — it's the core of the pandas' diet! Their perfectly straight stalks and mostly narrow leaves make them perfect plants for screening purposes. 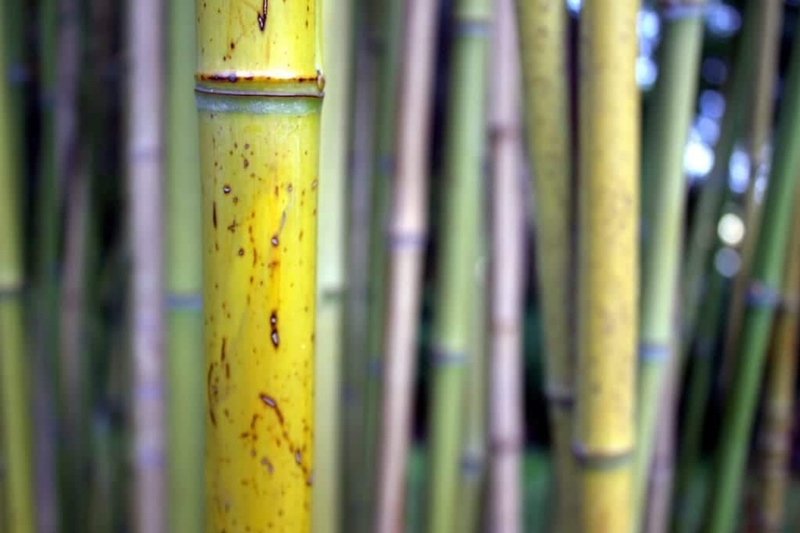 All bamboos have underground stems that we call rhizomes. The rhizomes are the storage organs for the bamboo. The roots are called "adventitious" — meaning that they develop around the nodes of the rhizome. Some varieties are called "leptomorphs", or "running roots", and we want to keep them out of our gardens to avoid invasion! Others, such as Fargesia are known as "pachymorphs", or "clumping roots", and won't spread. Bamboos love very sunny places and will accept practically any kind of soil — except dry! — with a slight preference for lightly acidic ground. Beware, bamboo of the Phyllostachys, Sasa and Arundinaria genera propagate themselves uncontrollably! In order to avoid a total bamboo invasion of your garden, place an anti-root or anti-rhizome barrier at the bottom of the planting hole, extending to 5 cm beneath the top of the soil on all sides with an angle greater than 15°, so that the roots will grow towards the top instead of going outwards under the barrier. If heavy landscaping scares you, plant bamboo from the Fargesia genus. If you plan to grow your bamboos in a pot, look for a pot or container that will be large enough, and mulch it heavily to keep the soil moist. Water regularly.